Symptoms of myocardial infarction, or heart attack, are different in men and women. Experts say signs of heart attack exhibited in men are not displayed by women. Extreme chest pressure is one symptom. 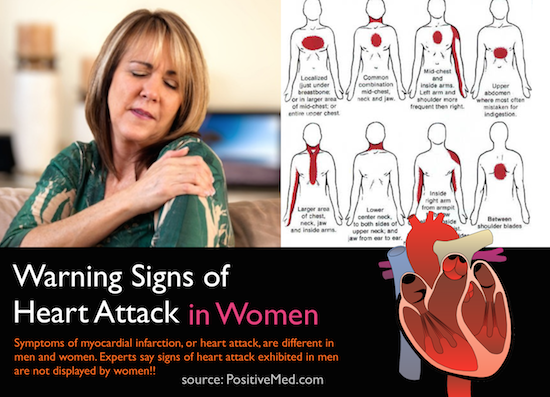 It’s important to understand the signs of heart attack in women as it can happen at any time. 1. Unexplained FatigueMore than 70% of women suffer from extreme fatigue before a heart attack. They suddenly feel exhausted even after small tasks like getting up from a chair and going to the kitchen. Flu-like exhaustion is also experienced by women. This fatigue is different from chronic fatigue that is caused by hormonal imbalance. 2. Struggling while sleepingIf you are unable to fall asleep it may indicate a heart attack. It’s difficult to detect this sign as it may be due to many other reasons, if you notice any unexplained reasons or prolonged disturbance in your sleep this may be warning you of a heart attack. One study found almost half of women who had a heart attack experienced sleep disturbances beforehand. 3. PainIf you are experiencing mild pain in your jaw, back, shoulder, neck, or ear, these might be signs of heart attack. Women usually don’t feel the numbness in chest and shoulder like men, but may feel tightness running along their jaw and going down the neck. These mild pains can expand down to shoulders towards left side. 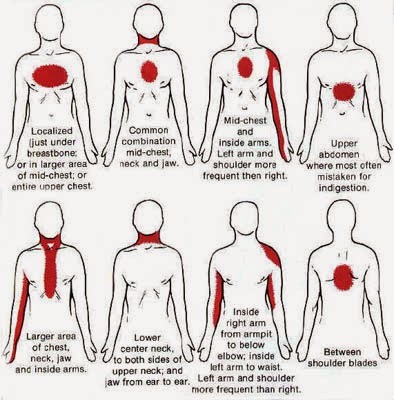 Pressure in breastbone and upper back are also signs of heart attack in women. 4. Short of BreathDifficulties taking long and deep breaths is a bad sign. More than half of women suffer shortness of breath before the heart attack. They find it difficult to talk from inability to catch oxygen. This is one of the most common early heart attack signs in women. 5. Indigestion or NauseaDizziness or nausea is a sign prior to heart attack women often display. They may have indigestion or vomit shortly before their heart attack. The chances of experiencing gastrointestinal problems double in women before a heart attack. 6. Anxiety and StressWomen often feel anxious, stressed, and keyed up before a heart attack. Anxiety is a common sign of heart attack in women, more than 30% of women get this symptom. This has been described as a feeling of impending doom by several women. 7. Sudden SweatSudden pallor for no apparent reason is not a good sign and may be an indicator of heart attack. More than 40% of women feel dizzy and break into a cold sweat before a stroke. You should call 911 when you experience abrupt lightheadedness or dizziness, these signs should not be taken lightly.